Try all you might, but no one’s perfect. For example, try to flawlessly set-up a WordPress site on your first try. That’s not saying that you lack the talent or skills. It just means that there’s a lot of work to and it’s easy to overlook one or two things. But, to help make sure that you can succeed in setting up and running your WordPress page, we’ve identified 25 of the most common mistakes on WordPress and how to avoid or fix them. Don’t be embarrassed if you don’t know the difference between the free WordPress.com or the self hosted WordPress.org. It’s happened to most of us in the beginning as well. So, here’s the main difference between the two: WordPress.com (which is run and maintained by Automattic) is a free option that pretty much anyone can use; WordPress.org may cost you some cash, but it’s perfect for people who want to have complete control over their site. Here’s a nifty infographic that pits the two against each other. Before committing to either platform, carefully weigh the pros and cons of each to make sure that you have the right platform for your needs. The major reason why WordPress and all of those plugins that you’ve installed are updated is because there was a security concern. This happens anytime someone WordPress core contributors or plugin authors notice there’s a security concern. By keeping WordPress and your plugins up to date ensures that you’re going to be protected. Updates are also used for browser compatibility, which is a also a big deal if you want your site to work properly on all browsers. You’ve probably noticed that when you download WordPress you’ve automatically been assigned the username ‘admin’ with administrator privileges. This may not seem like a big deal until a hacker comes along and has a field day at your expense. By leaving the username ‘admin’ you’re just making it easier for someone to come in and cause some havoc. For security purposes, make sure that you change the default WordPress admin username. And, don’t forget to include a blend of numbers, letters and characters when figuring out a new username. With so much going it can be pretty easy to forget to backup WordPress. But, we bet you’ll never forget that lesson if you lost your entire WordPress database after an update, changing themes or moving to a new domain. To save you a serious migraine, you should utilize plugins like BackupBuddy (Paid), VaultPress (Paid), and BackWPup (free). These will create automatic backups for your WordPress database. Not all themes are created equal. For example, a photographer wouldn’t use a theme that was intended for a finance companies and vice versa. Also, just because you shell out some cash for a theme doesn’t mean that it’s from a legit company. That’s why you need to make sure that you purchase or download a theme from a reputed site that fits your needs. Probably the best place to search for themes would be in the actual WordPress Themes Directory. If you really want to purchase a commercial theme then make sure it’s from a proper provider like Elegant Themes, StudioPress, Headway Themes, Themify, or ithemes. More likely than than not you’ve seen that you can label and categorize your posts in a number of ways. The problem is that during your excitement you get a little category happy and create several new categories for each blog post you compose. Why’s this a problem? Because it’s going to make finding related articles more difficult to find, which means a visitor isn’t going to stick around. Remember, don’t get category happy. Stick with the broad categories that are most relevant to your site. Wait. What’s a favicon? Basically it’s your site’s identity card, aka those icons that appear next to the your site’s page title. When people start using WordPress they forget or aren’t aware about favicons. That’s an issue since the favicon displayed will be from the theme company or web host. When that happens, it gives your site an unprofessional appearance. You can either make your favicon or select one from a free favicon generator. Once you have chosen a favicon just upload into the image section of your theme and then replace the previous favicon. While it is true that WordPress became a household name because it’s an incredible blogging platform, there’s a lot more to WordPress. Over the years businesses and universities have been using WordPress as a Content Management System and cost effective site builder. A permalink is that permanent hyperlink that goes to a specific blog post. If you noticed, that default link would be really generic, such as www.mysite/?p=123. That’s not good for business. If you want to rank higher in search engines and appear more professional, head over to Settings Permalinks and add the appropriate keywords. File Transfer Protocol (FTP) simply means sending a file from your computer to your web hosting server. Having permission to this feature will help prevent the dreaded white screen death – which means you’re locked out and obviously can’t do anything after pasting a code improperly. When you have FTP access you can log-in and delete the plugin causing all the problems. A contact form isn’t just that page where users add their email address. There’s more information required, like a name for example. The reason this is important is because if you’re only asking for an email address you’re to be receiving a lot of spam. You can simply add a contact form by installing a plugin like Contact Form 7 or Gravity Forms. During installation there’s an option that prevents bots from indexing your WordPress site. This isn’t a big deal when you’re still setting everything up, but this box has to be unchecked once your site is up and running. Why? Because your site will never get indexed, which again, is bad for business. Also, don’t forget to update your meta setting, even if you’ve installed a plugin like WordPress SEO by Yoast. Doing both of these will make sure that WordPress posts have been optimized for SEO. To make sure that your site doesn’t crash when there’s a ton of traffic you’ll need the W3 Total Cache plugin. What this plugin does is create static cache pages for each and every page that is loaded. This means that each page doesn’t have to be ‘dynamically loaded upon each page load.’ If you want to improve the experience of your users, make sure that this is enabled. Let’s say that you had to switch your site’s domain name. That shouldn’t be a dig deal. Unless you lose all of that had-earned traffic. Before officially making that move, take the steps to make certain that you won’t lose your traffic. You can learn how to properly make this move by checking out this guide on the WordPress Codex page. If you’re running a blog then you absolutely need an analytics program that will monitor traffic, inform you on the keywords that are working or not and track the behavior of your visitors. Google Analytics is a free analytics tool that provides all of these features. All you have to do is signup for Google Webmaster Tools. Gone are the days of using software like Microsoft Word. That’s not saying that it’s a poor piece of software. It’s been relied upon for years. What it means is that you can use the WordPress post editor that’s already built-in. Not only does it automatically save your work, it also prevents all those weird characters you may have noticed after pasting text from Microsoft Word. In case you weren’t aware, there are a lot of people doing their internet surfing on smartphones and/or tablets. That means that your WordPress site has to have a responsive theme (site adjusts to screen size) or is mobile friendly through plugins like WPtouch or WPTap. If not, you’ll be neglecting a significant amount of users. We’re all busy people. And if you didn’t notice, people are probably leaving comments on your site as we speak. Sometimes these are trolls who are are scaring away visitors and tarnishing your good name. Or, the comments just keep adding up and you have to spend hours going through them. If you’re not able to keep up with responding to comments, you may want to use the Disable Comments plugin. WordPress comes with a sample page. This content isn’t needed and it should be removed after you’ve installed WordPress. Here’s a short clip that shows how to properly delete this sample page. Site speed is really important – if your site takes too long to load, people will leave. That’s why it’s of the utmost importance to optimize the images that you use on your WordPress site. By doing this prior to uploading your images onto WordPress, you’re making sure that your site loads faster. If you’re not familiar with Gravatar, just know that it’s picture that represents you across the web. You’ve probably noticed them before too. If you’re left a comment on a blog post it would be that image next to your name. Why’s this important? It’s an easy way for your fans to spot you across the web. This can help your online visibility and grow a brand. If you’re more of a DIY individual then you’re probably tempted to hard code everything on your WordPress site. Here’s the thing. That pretty much defeats the purpose of WordPress. WordPress was intended to make your life easier because it’s incredibly simple to use. Another WordPress default is that ‘Just Another Blog’ tagline. The problem with keeping that tagline is that it’s getting indexed by Google. So, if you don’t delete this tagline, then you and a whole bunch of other people aren’t really standing out. You can make you own tagline by going into Settings General. After you’ve been doing the WordPress thing for awhile you may begin to notice that your sidebar widgets is going to get filled up with monthly archives, category archives, tag archives, author archives or whatever else you want to archive. To keep everything clean and organized, you can create a custom archives page. Whether it’s a small mistake, like the wrong font, or something major, like a code that freezes the page, you have to go through your site and make sure that it’s mistake free. Don’t assume that just because you did everything right that you didn’t have a hiccup somewhere along the way. There you have it. 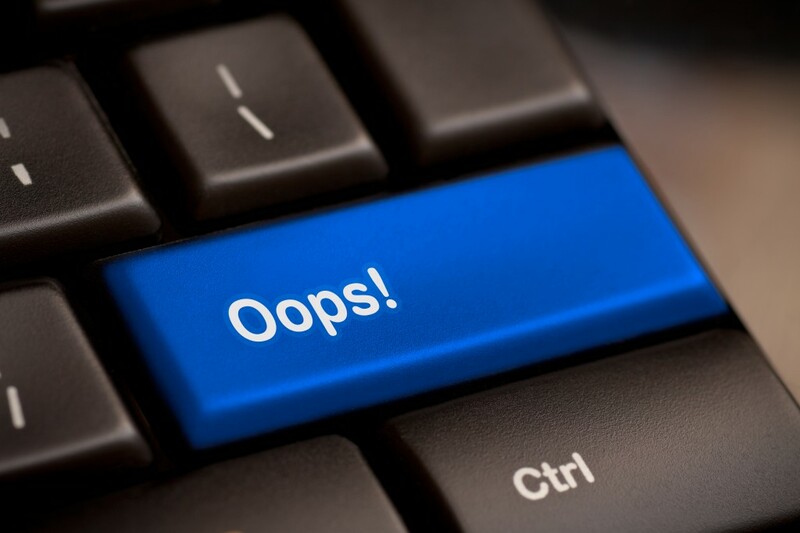 Our list of 25 common WordPress mistakes. Did we leave any out? Or did we cover them all?